FOLD THUMB OF INSERT INTO THUMB SLOT ON GLOVE. PUSH THE INSERT FIRMLY INTO THE GLOVE UNTIL IT STOPS. Learn to use your glove like the pros. No more errors, bad footwork, sloppy fielding technique, slow hands, plays that should have been outs! The upper portion protects your Wrist while practicing. Use the 2 hands training system to be a better fielder Two Hands offers what the others can't. 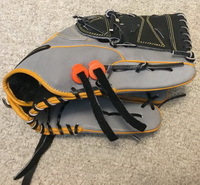 Two Hands easily fits into YOUR glove to make it stay open. Made of special plastic so it won’t break or damage your glove, and engineered to last forever. Two Hands is a inexpensive training aid compared to the Pancake glove (40-60$), or Deflector glove(100$), and more durable that a cheap piece of foam for a paddle tool. Two Hands Pro 3 easy step instructions for installation. 1. Hold your glove in one hand, line the pink and middle fingers up with the correct finger holes in your glove. 2. Turn your glove over, bend the last part of the insert labeled" thumb" into the thumb hole of your glove. YOUR READY. DO NOT SQUEEZE. Players under the age of 10 should use Two Hands Pro with adult supervision. Buying a wood bat is the most important item for today's ball player. Please look our selections over as these bats have been recommended by over 380 players of the Northwest Independent Baseball League an 18 Team Semi-Pro and Adult League in Portland Oregon.